Members of Generation Z, who were born after the mid-1990s, consume a lot of digital media. A recent study by Wibbitz found that Gen Zers watch an average of 3.4 hours of online video daily, compared to 2.5 hours for millennials. 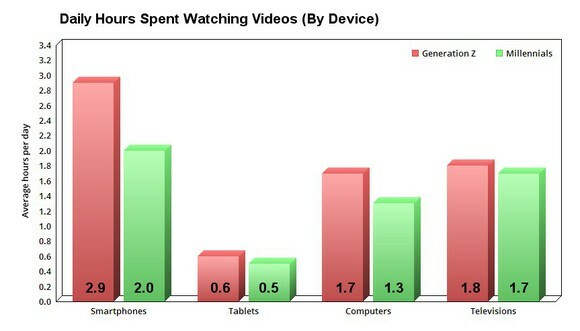 Gen Zers watch more of those videos on phones, tablets, and PCs than millennials. Data source: Wibbitz. Chart by author. Wibbitz also found that 90% of Gen Zers watched at least one hour of video per day on smartphones, compared to 83% of millennials. However, 70% of millennials watched at least one hour of video on TV daily, versus just 60% of Gen Zers. That split explains why so many wireless carriers launched zero-rated video-streaming plans for phones. T-Mobile's Binge On, for example, lets subscribers stream Netflix, Amazon, Hulu, and other video services without incurring data charges. It also explains why social networks are integrating in-app videos. Facebook introduced its video platform, Watch, in 2017, and Snap relaunched vertical "Snap Originals" videos for Snapchat in 2018. Looking ahead, the battle in streaming videos should keep shifting from TVs to mobile devices as these companies try to lock in more Gen Z viewers. John Mackey, CEO of Whole Foods Market, an Amazon subsidiary, is a member of The Motley Fool's board of directors. Leo Sun owns shares of AMZN and FB. The Motley Fool owns shares of and recommends AMZN, FB, and NFLX. The Motley Fool recommends TMUS. The Motley Fool has a disclosure policy.